A conversation with the author of the new book The Jewish Olympics on what the Maccabiah Games have meant, what they mean, and where they're going. The Maccabiah Games take their name and image from Judas Maccabeus, the guerilla warrior who died fighting for the Jewish people around 160 BC. The Maccabiah Games were founded in 1932 to foster “tribe pride” amid rampant anti-Semitism (including in the United States). They also provided an alternative to the 1936 Berlin Olympics, when the host country as well as other nations all but barred Jewish athletes from competing. Along with the concurrent success of Detroit Tigers slugger Hank Greenberg and champion boxers Benny Leonard and Barney Ross, the Maccabiah Games helped counter the stereotype of the bookish and frail Jew. Today, the Maccabiah Games continue to attract thousands of athletes even though they’ve been dwarfed by an oversaturated sports landscape. They convene every four years in Israel, with the 20th edition scheduled for 2018. The Hebrew jock-ocracy that has participated in Maccabiah Games includes Lillian Copeland, Larry Brown, Mark Spitz, Danny Schayes, Ernie Grunfeld, Mitch Gaylord, Lenny Krayzelburg, and Jason Lezak. Kaplan is the sports and features editor for the New Jersey Jewish News, the proprietor of an exhaustive baseball book blog, and the author of another book, 501 Baseball Books Fans Must Read Before They Die. He lives in New Jersey. 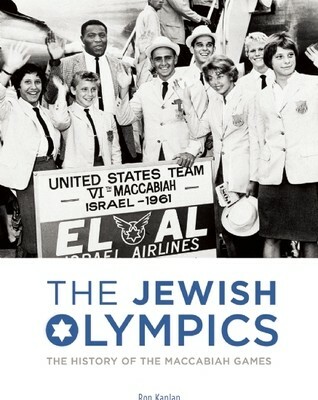 I interviewed Kaplan over email about the Maccabiah Games and his latest book. What was the primary reason for the formation of the Maccabiah Games and has the original vision of the Games changed over the years? Jews had been discriminated against for a long time. Even after they had achieved a level of financial and social success in Eastern European countries, they were excluded from many clubs and societies, including those that concentrated on sports. You would think the only criteria there would be the ability to do well in the given activities. The Maccabiahs were designed as a place where Jews could compete without such restrictions. Of course, this applies almost exclusively to male athletes; sportswomen had their own set of prejudices to deal with. The original vision remains in place, although the reasons for the Maccabiah Games have changed to incorporate a cultural aspect, a teaching tool for those Jews who may not be familiar with their religion or the ancestral homeland. You write that, during the Maccabiah Games of 1932 and 1935, many Jews used the occasion to flee anti-Semitism and re-locate to what would become Israel. Can you estimate how many lives the Maccabiah Games saved by allowing European Jews to escape the concentration camps? Hundreds, I’m sure, although it’s difficult to estimate. The entire Bulgarian delegation—including a group of musicians—refused to return after the Games. That alone accounted for about 350 or so who just blended into the background. Maccabiah officials and other administrators invoked an “honor system” and implored the visitors to go home at the end of the event, but obviously many stayed behind. I’m surprised the British authorities [who governed the region in the years before World War II] didn’t do a better job at policing the situation. Mark Spitz made his international debut at the Maccabiah Games. How did that experience affect his Olympic career? Spitz participated in the Maccabiah Games in 1965 at the age of 15 and again in 1969, winning a total of 10 gold medals. He was named outstanding athlete for both Games. No doubt this made him comfortable in such a large setting, but I doubt the level of competition at the Maccabiah Games overall was as challenging as what he would face on the Olympics in ’68 and ’72. Nevertheless, Spitz was always a confident athlete who probably thrived under the additional pressure. Was Spitz the most successful athlete to compete at the Maccabiah Games? That depends how you define success. In terms of medals, there have been several athletes who have won more, either in one set of Games or over the course of their Maccabiah careers. Anita Zarnowiecki and her twin brother Bernt combined for 13 swimming medals in the 1973 Games, but because they were from Sweden you’ve probably never heard about them. Spitz was certainly one of the most recognizable, but that might all have been a moot point had he not excelled in the Olympics. Basketball has emerged as the centerpiece competition of the Maccabiah Games. How did that happen? Is Tal Brody the biggest hero of the Maccabiah Games? Without having studied the origins of basketball in Israel, I can only imagine it had a similar popularity growth as in the U.S. It didn’t require a lot of equipment or space, a primary consideration in a developing country. Looking back over his contributions to the Israeli sports world, you could easily say that about Tal Brody. He gave up a career in the NBA to remain in Israel, where he led them to an unfathomable win over Russia in 1977 [a victory over CSKA Moscow, the Soviet Army team, in the European Championships], which he claimed put Israel “on the map.” Since then, Brody has become a national treasure as a sports ambassador. The Maccabiah Games have never been the direct target of a terrorist act, but did suffer tragedy with several deaths and multiple injuries after the collapse of a bridge before the opening ceremony in 1997. Do you think they should have cancelled the Maccabiah Games after that incident or were the organizers correct in deciding to let the Games play on? Although there were no attacks at the Games, there were a few terrorist incidents in relatively close proximity that were designed to create mayhem for the increased number of visitors [athletes and fans] to Israel. In 1989, a suicide terrorist took control of a passenger bus near Ramat Gan and sent it careening into a 400-foot ravine, resulting in the deaths of 14 people and injuring almost 30 more. In 2005, a suicide terrorist killed three and injured another 20 in Netanya two days before the Games were set to open. The 2001 Intifada almost forced the cancellation of the 16th Games, as several delegations looked to pull out for fear of dire consequences. Once the United States decided to go ahead, other countries followed suit. In 1997, there were two members of the Australian delegation who died on the spot and two more who died of their injuries afterwards [after the bridge collapse]. While all this was going on, the crowd inside the Stadium was unaware of the tragedy, and the opening ceremony continued. The section in the book describes the agonizing decision-making process to carry on as a tribute to the fallen Australians. Not everyone was pleased with the way the situation was handled, much like the 1972 Munich Olympics. What is the biggest misconception about the Maccabiah Games—and what was the most surprising discovery that you made in researching and writing the book? I think the Maccabiah Games are one of the best-kept secrets in sports, even among Jews. A lot of people are surprised to learn that, after the University Games, it is perhaps the largest amateur sporting event in the world. The biggest surprise—actually disappointment—was the lack of media coverage, especially early on. Most of the stories in the U.S. came from Jewish newspapers about members of their community who were involved with the Games. The lack of mainstream reporting created a major problem [in researching the book], especially when it came to finding accurate numbers in terms of participation, attendance, and even the medal-count. You point out that the so-called “Jewish Olympics” by their very nature are exclusionary. How do you reconcile that with the ostracism that the Jewish people themselves have endured for millennia? How do the neighboring Arab communities and nations feel about the Maccabiah Games? But early on, how do you think the Arabs felt? Would you want an influx of strangers coming into your community? A lot of concessions had to be made in the first set of Games. Is there still a place for the Maccabiah Games in their current form today, do you think? As a sporting event, I do have to wonder. The reasons for the Maccabiah Games for that purpose no longer seem valid since Jewish athletes participate on every level in just about every country. It has become more of a cultural event, an opportunity to meet fellow athletes from around the world and learn. The additional component of traveling around Israel is also a consideration. Another consideration: The Olympics move to a different location every four years, but the Maccabiahs are always in Israel. The financial burden is tremendous. One of the other hats you wear as a journalist is maintaining your baseball book blog. What’s your favorite baseball book published so far this year and why? I’m embarrassed to admit that I’m a bit behind on my baseball reading for any number of reasons. Nothing that I’ve read so far has really thrilled me, but the next one in the queue is something I’ve really been looking forward to: an updated edition of The Hidden Game of Baseball, by John Thorn (official historian for Major League Baseball) and Pete Palmer. It was originally released 30 years ago, but I don’t think I was intellectually equipped to enjoy it at the time. Hi there...really information is good ,this post is useful and informative...It has helped me get some nice ideas thanks for sharing this ..